This is a full-fledged Expert Advisor trading by renko bars. Renko bars are simulated inside the EA allowing for high-quality optimization. Orders are opened in the direction of the last simulated bar. 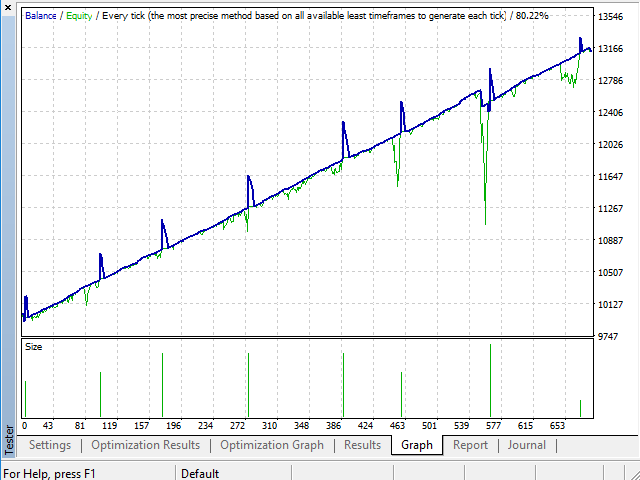 The EA strategy is based on simulating renko bars for defining a trend and its duration. The signal is then sorted by Parabolic SAR, Moving average, Moving average2 and Heiken Ashi filters. The application of two MA filters allows applying a trading strategy based on two MA (fast and slow MA) and renko bars. Trailing stop, fixed stop and Time Outs and Targets Settings target-time position closing system are applied for closing trades. The EA does not display the renko chart! RenkoBarSize - renko candle size (10-1000). Maximum positions count - the maximum number of positions opened at a time. Count bars wait before open position - the number of renko bars that must be formed before opening a position. For example: if set to 2, then 2 bullish or bearish bars must be formed before other entry conditions are checked. enable risk management - enable/disable risk management. risk in percentage of the account - risk value for management. Stoploss - stop loss (20-750). Takeprofit - take profit (20-750). MagicBuy - magic number for buying. MagicSell - magic number for selling. Close on profit(total) - close all trades in case of a total profit (in deposit currency). Close on profit(Buy) - close in case of a profit at all buy positions (in deposit currency). Close on profit(Sell) - close in case of a profit at all sell positions (in deposit currency). Close on loss(total) - close in case of a loss at all positions (in deposit currency). Close on loss(Buy) - close in case of a loss at all buy positions (in deposit currency). Close on loss(Sell) - close in case of a loss at all sell positions (in deposit currency). Step between positions - step between open positions: approximate value from 20 to 200. UseTrailing - enable/disable trailing of profit. Start trailing on profit - value in the deposit currency to start trailing profit. Step trailing on profit - trailing step in the deposit currency. CloseOnRevers - close all positions when an opposite renko candle appears. Traiding start time - trading start hour (0-23). Traiding end time - trading end hour (0-23). UseMa - apply МА filter. MaPeriod - МА period: approximate value from 1 to 100. MaMethod - moving average type. CloseOnMa - close all positions if a renko candle crosses МА. UseMa1 - apply МА filter. MaPeriod1 - МА period: approximate value from 102 to 260. MaMethod1 - moving average type. Attention! The value of MA1 must be greater than MA. UseHaFilter - enable/disable the Heiken Ashi filter. ShowHa - display/hide Heiken Ashi. UseSarFilter - enable/disable the Parabolic SAR filter. SarStep - Parabolic SAR indicator value (0.01-1). SarMaximum - Parabolic SAR indicator value (0.01-1). usetimeout - close positions by Time Outs and Targets Settings. timeout1 - time interval for closing a position (1-300). target1 - target value for closing a position by timeout (from -25 to 25). The value may be negative to close unprofitable positions. timeout13 - time interval for closing a position (1-300). target13 - target value for closing a position by timeout (from -25 to 25). The value may be negative to close unprofitable positions.